We’d love your help. Let us know what’s wrong with this preview of The Baby Is Here! by Angela C. Santomero. Daniel Tiger gets a baby sister in this adorable new 8x8, based on a special episode of Daniel Tiger’s Neighborhood! Daniel Tiger is getting a little sister, and he can’t wait to meet her. 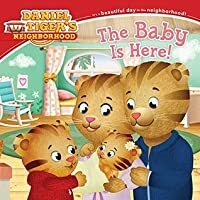 He’s looking for a special way to help welcome the new baby—and h A new generation of children love Daniel Tiger’s Neighborhood, inspired by the classic series Mister Rogers’ Neighborhood! Daniel Tiger is getting a little sister, and he can’t wait to meet her. He’s looking for a special way to help welcome the new baby—and he finds the perfect present to give to his new sibling in a box of his old baby things! This sweet story is perfect for little ones who are about to become big brothers or sisters! To ask other readers questions about The Baby Is Here!, please sign up. Be the first to ask a question about The Baby Is Here! Ho hum, but filled the time while the toddler was waiting for their mom to pick them up. My obsession with all things Daniel Tiger continues. This is a fun book introducing the concept of having a new baby in the house and being a big helper to those in your family. I was really looking forward to reading this one with Lydia, but I found it to be too wordy, and I wish it focused more on after the baby was born and not the preparation for baby. Bought this book for my nephew. He LOVES Daniel Tiger! Another great Daniel tiger read. I think it's adorable and shows great character in Daniel as he tries to find a present for his new sister. I also appreciated that it says mom went to see the Dr and didn't get technical about labor. My daughter really enjoys all the Daniel tiger books. Angela Santomero is television producer and creator of such children's shows as Daniel Tiger's Neighborhood, Wishenpoof, Super Why!, and Blue's Clues. She is a graduate of Columbia University. Trivia About The Baby Is Here!